We've all heard this time and time again: don't judge a book by its cover. Smile politely at that intimidatingly burly stranger, and you may find a warm smile greeting your own. Crack open the spindly exterior of a rambutan, and you'll find a lychee-like fruit as smooth and pretty as a pearl (and tasty to boot!) While I don't want you to go around winking at brutes who'd just as soon chuck you across the room or begin taste-testing pretty little mushrooms off the ground, I do hope you'll check your expectations every now and then and open yourself up to pleasant surprises. 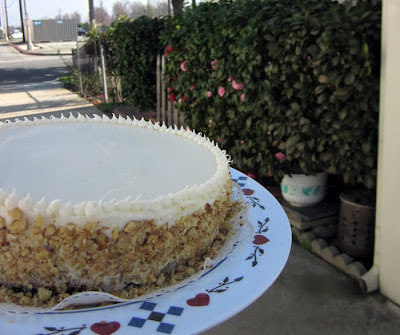 For example, after one look at the photo at the top, if you were expecting cheesecake or carrot cake -- think again. One slice through this simple little cake, and you'll find yourself fork-deep in chocolate, chocolate, glorious chocolate. Now if you were anxiously awaiting cheesecake or carrot cake, my apologies! 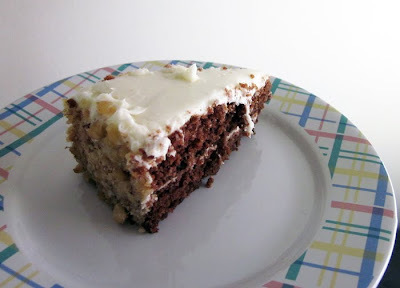 But have a taste, and I don't think you'd miss either, as you'd have some of the best elements of both: rich, fudgy chocolate cake with luscious Bailey's cream cheese frosting (tasting just like a cheesecake) plus the nutty notes of toasted pecans that you'd expect in the most traditional of carrot cakes. I hope you're all having a fantastic 2011 so far and that there will be many sweet surprises ahead!